The new underwater restaurant is the much talked about topics this season. When it comes to fine dining, you may think of some romantic candle light dinners or would probably visit some other country for a more adventurous experience of dining underwater. 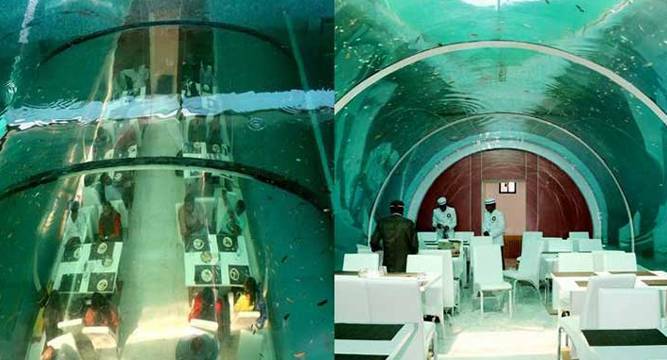 But now you can experience the same in India as the country gets its first underwater restaurant named ‘Real Poseidon’ in Andhra Pradesh. The restaurant opens today on February 1 in the South Bopal area with 150 bookings in advance. It is built 20 feet below the ground level. It is spread across 3000 square ft, it’s plushed with 1,50,000 litres of water. the restaurant features around 4,000 fish and marine species sourced from local markets in Ahmedabad, Rajkot and Vadodara. Real Poseidon offers vegetarian food from different cuisines like Punjabi, Thai, Chinese and Mexican. The restaurant has a 1,200 square ft dining hall with 32 seaters. It is run by Ahmedabad-based businessman Bharat Bhatt, who owns an engineering unit and is also into construction. A whopping sum of Rs 2 crore was spent on its construction.